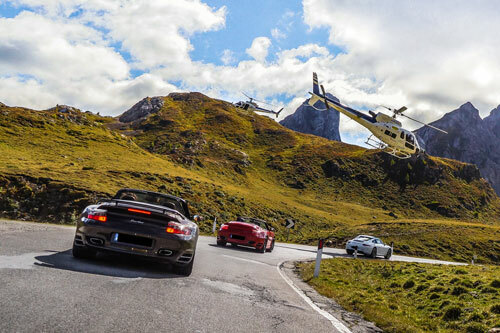 We will accompany you with our safety cars through the Dolomites and the most beautiful mountain passes in the world. You can also choose Lake Garda or Venice as your destination of choice. We will take you to remote places where traffic is unheard of. Here you can experience the streets again. Nothing for the faint hearted! 13 passes, 350km, over 20,000 metres of altitude and turns and bends as far as the eye can see. We will bring you and your vehicle to your limits. This is the hardest tour that is offered. Welcome to hell! All participants that succeed will gain the Dolomiti Hero Trophy and will be immortalized on the Dolomiti Hero wall. We accompany you with our safety car through the Dolomites on the most beautiful passes in the world. The highlight of the experience is when the helicopter and film crew follow you. 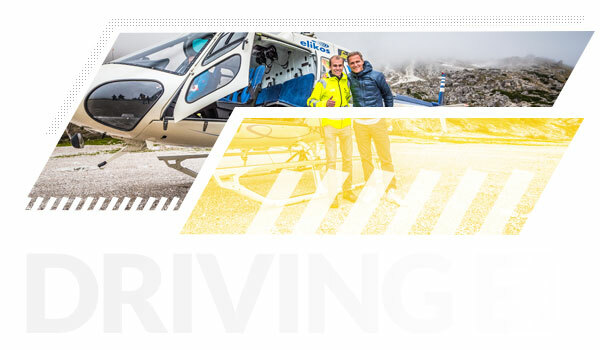 Afterwards, helicopter canyoning is on the cards; experience the Dolomites from a completely different perspective. Matthias Malmedie, known from the "Grip - Das Motormagazin" show on RTL II, is our official driver in the Safety Car. Get to know the charming sports car expert personally. An unforgettable experience for all motorsport friends. Of course, you can book Matthias for a private event or a group event as well. Experience the 4 elements in one day. We start in the winding Dolomites. The route takes us to 2,244 meters and then passes through beautiful, barren wine country to Lake Garda, 65 meters above sea level. The helicopters are waiting for us and show us the beautiful landscape from above. Lake Garda is unique - mountains, water, olives and vineyards characterize this area. After the flight? Speedboats with 1,000 bhp bring us to an excellent lunch in a secluded bay.